I like the feeling of a book, as opposed to a gun, in my hand. I’ve been holding a lot of books recently, all while reading to my granddaughter. She has a voracious appetite for the printed word, and an impressive collection of books, both recent and hand-me-downs that I read to her mother 30 years ago. On the outside, the old and new books look more or less the same, pictures of bears and boats, princes and princesses. The covers are often made of fairly sturdy stock to withstand the unrelenting “attention” they sometimes get. The insides tell a different story. It is easy to tell the old from the new. And it is not the color of the paper or the dog-eared corners of the old that gives them away. It is something that is printed in black and white inside every one of them. I am not sure why I first looked and started noticing it, but once I did, it was impossible for me not to check each one my granddaughter handed me to read. As soon as I could get a chance, I’d flip to the copyright page, usually near the front, but occasionally hidden more discreetly at the back. Down toward the bottom of that page, usually in small letters – though in more recent editions there is a clear trend toward larger, bolder type – is the printing information. Most commonly it is a simple, “Printed in…” declaration, though occasionally, in the older editions, there is more detailed information, such as which typesetting union was involved. Without exception, all the newer books have the same statement, “Printed in China.” In contrast, not a single one of the 30 year-old editions have a similar provenance. Because they are English language, they say, “Printed in the United States,” or “Printed in the United Kingdom.” There are a few exceptions, but they are all from the English speaking world. Although this is far from a scientific sample, I find it extraordinary how complete a transition has occurred, and so quickly. I am sure that if I had been a typesetter in the 1980, like a young communist friend of mine in that era in New York City, then I would have all the scars and know the details of how the printing business “went offshore.” But it happened silently for me and I had not even noticed it. A whole industry had been “offshored” and I never knew it. And, of course, the printing business is only one of many that have moved to China. From looking at copyright pages, I shifted to clothing labels. Same story: China, China, China. And a million other household items, and the jobs that went with them, took the same route, in two or three short decades. It is easy to say that “globalization” was the impulse, but globalization is just a policy and an ideology. It is a nice way for the ultracapitalist to reduce costs, eliminate the distraction of unions, and grow markets all in one go. Globalization promoters tout lower consumer costs as the high-value “benefit.” They also pretend it is a natural, even inexorable, expression of democracy, implying that democracy itself is being extended to the countries that have now become manufacturing powerhouses. While the US has exported manufacturing capacity at a dizzying rate, China has grown into a leading world economic power, with mega-cities mushrooming out of old regional capitals seemingly overnight. Chinese citizens, however, face ever more stringent controls over their lives, including their right to live in those cities. They may now have access to iPhones – if they can afford one – but they cannot peruse the Internet at will, or chance a word critical of the supreme leadership. By the same token, the loss of job security at home has put a gun to the head of democracy, as people grasp at false solutions to overblown threats from immigrants, Muslims, and a host of other imagined perils. As a friend put it, the US has shifted from manufacturing jobs to manufacturing threats. The so-called Free Market isn’t free, nor does it necessarily produce freedom. To state what should be obvious, the Free Market is about profit. And the drive for profit can produce (or reinforce) an authoritarian state as quickly as it produces a democratic one. Even quicker, actually, as China is proving. It’s interesting that those “old” books sometimes mention a typesetter’s union in the USA. Imagine that — unions! Unions that ensured American workers got decent pay and benefits. Well, we can’t have that in the land of the free, can we? Yes, it is the sad truth that those unions have been decimated… but that, ultimately, is one of the goals of globalization, i.e. to weaken labor. It is written that after Nixon’s resignation-in-disgrace, relaxing on the veranda of the former “Western White House” in San Clemente, CA he pointed out across the Pacific and sighed: “Out there, is China.” Obviously he was an ‘A’ student in Geography, by golly! More than some of his Republican successors, whom I need not name, could have claimed, that’s for certain. But, I digress. The point is that Nixon and Co. recognized the stupendous opportunity to exploit incredibly cheap labor in the Asia region and set the ball rolling. Few in the US have ever pondered the significance of the fact that US corporations could pay to ship components overseas for assembly and then pay to import the finished products back and sell them here to realize a greater profit than if all the work had been done on US soil. Now THAT is cheap labor!! According to Libertarian Gospel, this is The Magic of the Markets at work! So let’s all grab our US flags–probably made in China, if not Pakistan or Thailand or Guatemala–and wave them vigorously in celebration! Thank the author, Greg. He chose it! The other revolution was containerized shipping, which made it possible to ship things very cheaply across the world. Combine Nixon’s “opening” to China with greed and cheap shipping and you get today’s scene. The title is interesting if you are aware of the supposed history connecting Tesla and the creation of ‘Curious George’. 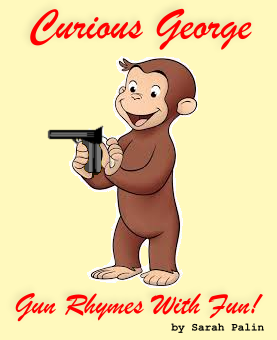 And how does this pertain to “Curious George”?